American Canyon is located between Napa and Vallejo, where the Napa River starts to merge with San Francisco Bay. Today I enjoyed getting my Bay Trail walking feet back, after a month's break (spent traveling and investigating other Bay Trails). Previously, last month, I had walked the newly opened section of Napa River/Bay Trail from this same parking lot in American Canyon with a friend. Thank you to Alec for joining me on today's walk along Wetlands Edge (road). As we got out of the car in the parking lot, we enjoyed briefly watching a group of young girls flying kites made out of paper bags. What the kites lacked in terms of aerodynamic prowess, the girls made up for in terms energetic kitesmanship. From there we turned the corner to Wetlands Edge to start our walk. The Wetlands Edge stretch of Bay Trail allows pedestrians (and leashed dogs) to walk on a wide sidewalk, on the River/Bay side of the road. On the East side of the trail is a suburban neighborhood. To the West, is open space and water. 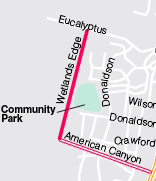 We walked the complete length of Wetlands Edge, plus a small stretch of W. American Canyon Rd. (as far as Hummingbird Way), before returning to the car. 7 unidentified flying bugs; 65 ducks; 520 medium-sized unidentified brownish shorebirds; 15 small unidentified brownish shorebirds; 4 American Avocets; 3 sea gulls; 3 turkey vultures; 1 white swan; 1 tiny brown lizard (or skink? ); 21 pigeons; 1 brown and orange butterfly; 4 little brown jobs (LBJs); 1 black beetle; 2 crows; 1 kite (bird); 1 tiny pillbug; 1 dragonfly; 1 cat (feral? domestic? -- hard to tell, maybe half and half).